Medium is a great place for expressing ourselves in longform and discovering new perspectives. Unlike other social media outlets, it runs on a slower, more thoughtful pace, enabling us to meditate on new information and form our own opinions. Yet the platform doesn’t seem to have fully gained traction here in Singapore. Here are 5 Medium accounts and collections that can give you a different view of this country. Accordingly, the features are largely driven by colourful anecdotes from the workers and captivating photographs, giving us insight into a segment of society often misunderstood and under-appreciated. 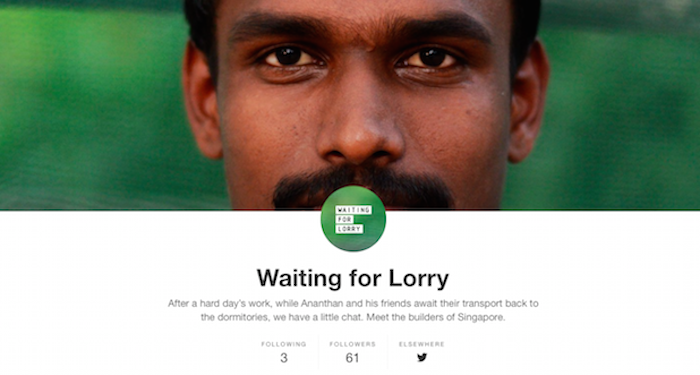 If you loved Humans of Singapore and Beyond the Border, Behind the Men, you should definitely check this out. From a lightsaber swordsmith to a Pokéball craftsman, the makers of Singapore dream big, and bring their visions to fruition with their handiwork. 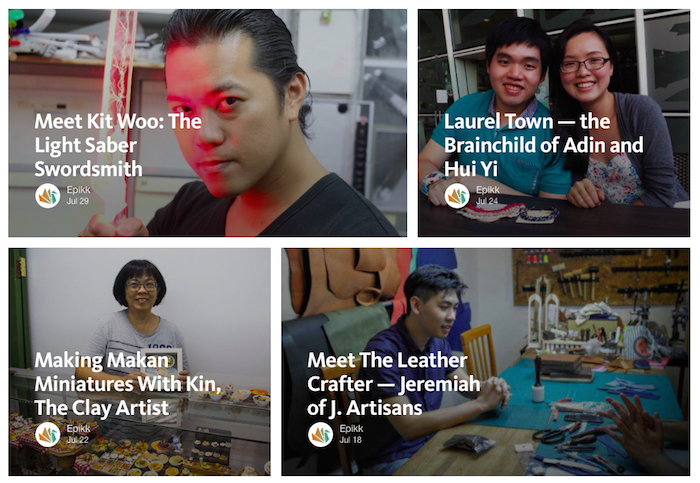 These are everyday Singaporeans who set aside time to pursue their passion for craft and design, unfazed by the unconventionality of their hobbies. These insightful features are written by Epikk, a platform where “makers from all disciplines and all walks of life could come together and share what they do”. If you’re looking for that extra bit of drive to start a new hobby or learn a new skill, perhaps this Medium publication can help. With greater ease of travel comes a highly connected world, and sometimes, this messes with our sense of identity. What does it mean to be a citizen of a country anymore, when country borders carry little meaning in this Internet age? 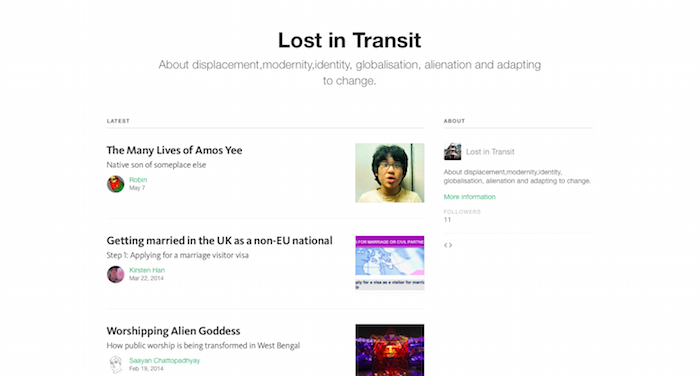 Lost in Transit is a Medium collection of stories on “displacement, modernity, identity, globalisation, alienation and adapting to change”. Expect a motley collection of personal essays, from transitions in West Bengal’s public worship customs to an exploration of the fragmented identities of Singapore’s very own Amos Yee. And if you’ve ever felt lost in transit amid the rapid changes of the world, perhaps you too can pen your thoughts. 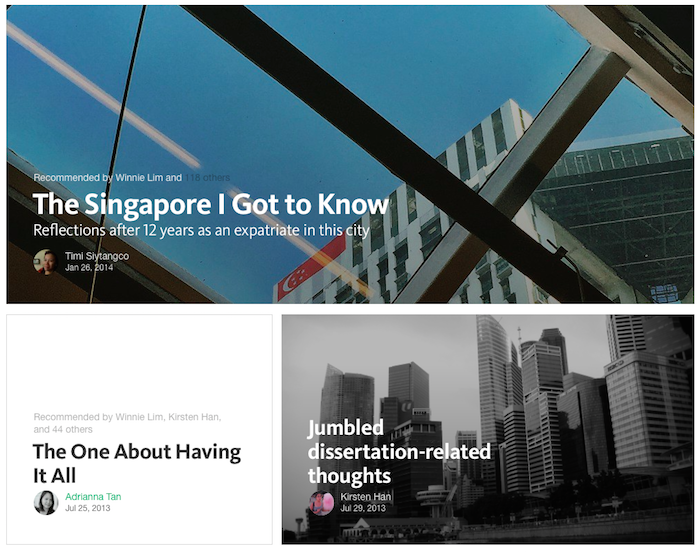 A series of musings on society and politics, Singapore Conversations provides a discussion platform for “anyone who cares to write” and “anyone who cares to read”. From a quirky encounter with a taxi driver to a reflection on how we treat domestic helpers, this collection offers some in-depth perspectives on what it means to be Singaporean, and how we can actively take ownership of our identity. The series has been dormant for some time, but perhaps the writer in you might be inspired to make a fresh contribution and revive this important conversation. No collection of commentaries on Singapore is complete without the sparkling wit and humour of well-loved blogger Mr Brown. Follow his Medium account for your dose of gadget reviews (most recently on the iPad Pro), travel blogging and thoughts on parenthood. A personal favourite of this writer is “7 Things Every Person Should Do Before 7am”, a satirical take on the lifehacker-esque style of inspirational writing that has flooded our social media feeds.